Eames utilized the same technology that led to the creation of their legendary molded plywood lounge and dining chairs to design this Plywood Cocktail Table. Introduced in 1946, this unit is perfect at home or in the office as center piece coffee or cocktail table. The plywood table is framed by four lean legs that create a durable yet lightweight base. Its “saucer”-like top and curved legs create a graceful shape that is compact and evenly scaled. $225 is the price for the Breuer Laccio Nesting Table from www.gibraltarfurniture.com (800 416-3635). 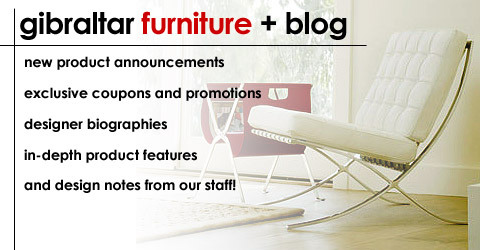 The #1 web site for high quality product at cost effective prices is Gibraltar Furniture! DWR sells this piece for $432.00. The original design dates back to a 1925 blue print by Marcel Breuer. It features a low maintenance laminate top. In the 1920s, Marcel Breuer began to experiment with tubular steel, creating some of the most influential furniture to come out of the Bauhaus. Breuer’s very simple, very clever multipurpose nesting tables exhibit his rationalist aesthetic and accomplished technique. The construction is extremely stable; the materials are of exceptional quality. The cool beauty of the chromed steel and thick-lacquered top will not diminish with use or time. Simple assembly required. This contemporary masterpiece is perfect for both residential and office use. The Italian leather we use on this piece is ultra supple high end material manufactured in Europe by the Mastrotto Group. Based in Arzignano (Vicenza, Italy), the Mastrotto Group is the gold standard for world wide hide production and one of the most important global sources for the creation of upholstery, furniture, and leather goods. They are the exclusive source for all of the leather used in Mercedes Benz and BMW automobiles. We can produce this chair in Black, Bright White, Camel, Chocolate, Ivory, Black, Red, Saddle Tan. Bordeaux, Cognac, Cappuccino, Golden Tan, Hunter Green, Navy Blue, Parchment, Tangerine, Wasabi, Cranberry, Toffee, or Whisky in your choice of three different leather grades including Deluxe, Primo, and Exquisite. This is a true leather Brno flat chair with an armrest, made of custom imported stainless steel that is highly polished to chrome like finish. The leather is pulled tight and sewn straight. The cushioning is supple and supportive. The frame is made of premium stainless steel, polished to a mirror shine. The Brno Flat Chair is a sophisticated collector’s piece with the presence of sculpture and is fabricated of weighty thick-plated steel. The Brno Flat chair is both a superb and timeless architectural statement. This is one of the most beautiful chair designs ever created and has proven to be a timeless design. It is both powerful in its grace and elegant in beauty. The Brno is both perfect for home or office. This 1929 design is the epitome of good taste and design. The Knoll list price on this is $3,806. We sell it for $695!